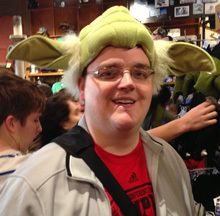 I love my God, my wife, my church, my job, Star Wars, and video games. I only guarantee the first two are in the correct order. As a senior in high school, I bought my first video camera. Now I’m addicted. Since then I’ve gone to college, married the fantastic Jessica Smith, and worked a few jobs. My favorite (and current) job is serving as the media director at Shawnee Baptist Church. It started as a task to build a new website for youth conference, then the church. Suddenly I found myself doing everything from advertisements to skit videos. It was scary at times, but I’ve learned a lot since then. At Shawnee, they call me the Media Director, but I have a confession to make: I’m the only one in the department. I quickly learned that’s how a lot of church media ministries work. I’d like to help if I can so glance around the site, learn some things, ask questions and grab some freebies on the way out. And if you don’t have a media ministry, let me know if you’d like to hire me for a job or two.